Sunscreens are more effective than ever, but today’s ultra-high SPF systems can be a challenge to preserve. This is particularly true when using modern, non-traditional preservation methods. The preservation experts at schülke have found that sensiva® PA 40 is the perfect solution for these difficult-to-preserve systems. A blend of natural, nature-identical and gentle synthetic materials, sensiva® PA 40 has proven effective in formulations where other similar preservative blends have failed. In their continuing effort to provide customers with the best formulation guidance, schülke has researched why some formulations are harder to preserve than others. This research first led schülke to investigate the effects of natural oils in emulsions. The findings from this investigation have paved the way to further studies in the preservation of other hard-to-preserve formulations, such as sunscreens. Although different in many ways, products containing natural oils and high SPF sunscreens pose similar problems with regard to preservation – both often contain high levels of polar oils and esters. Traditional preservatives, like formaldehyde-donors and isothiazolinones, are extremely water-soluble and remain in the water phase of emulsions, where microorganisms exist. Because of this, traditional preservatives remain effective, even in high oil-phase systems. However, many newer, alternative preservation methods (i.e. containing caprylyl glycol, phenethyl alcohol, ethylhexylglycerin) have limited water solubility. Therefore, the partition coefficient between oil and water phase of preservatives/antimicrobial boosters plays an important role regarding their efficacy in emulsions. For this reason, these newer systems may be less effective in the presence of high levels of polar oils. Sunscreen formulas based on organic sun filters become increasingly difficult to preserve as the SPF increases. This can be attributed to the increasing level of polar oil phase. 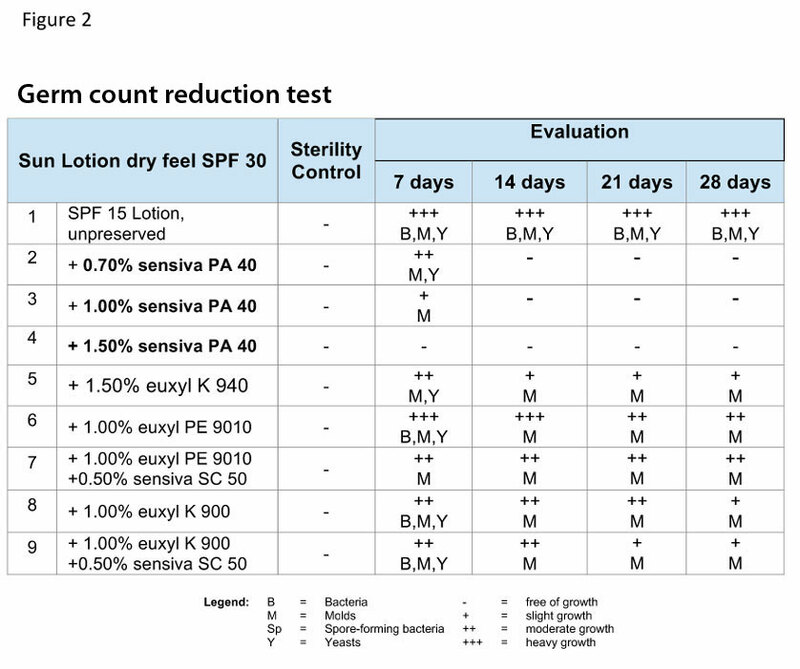 schülke tested an SPF of 30 sunscreen based completely on organic sun filters to determine optimum preservation (figure 1). 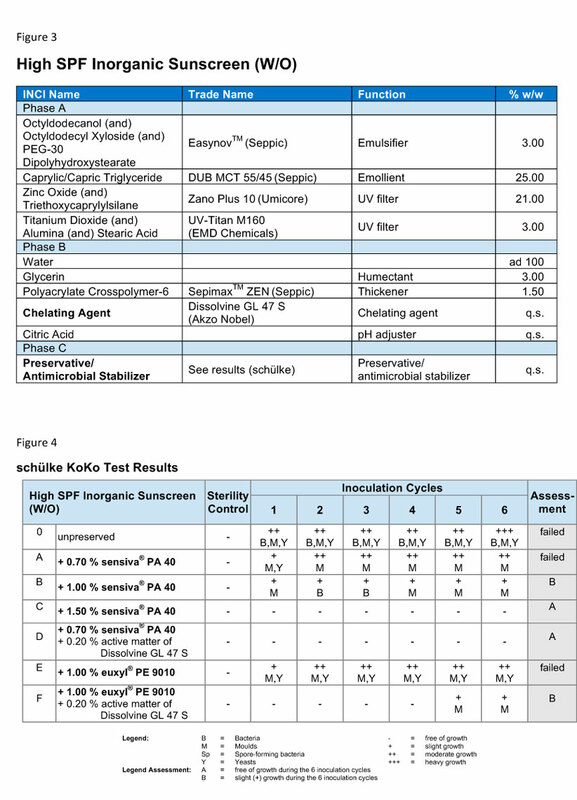 sensiva® PA 40 (a blend of natural, nature-identical and gentle synthetic materials) was tested against euxyl® PE 9010 (phenoxyethanol + ethylhexylglycerin), euxyl® K 900 (benzyl alcohol + ethylhexylglycerin) and euxyl K 940 (phenoxyethanol + benzyl alcohol + ethylhexylglycerin) in a standard 28-day, single inoculation germ-count reduction test. This testing showed sensiva® PA 40 used at 1.5% was the only variant that reduced the germ load of all organisms effectively for the full duration of the test (figure 2). 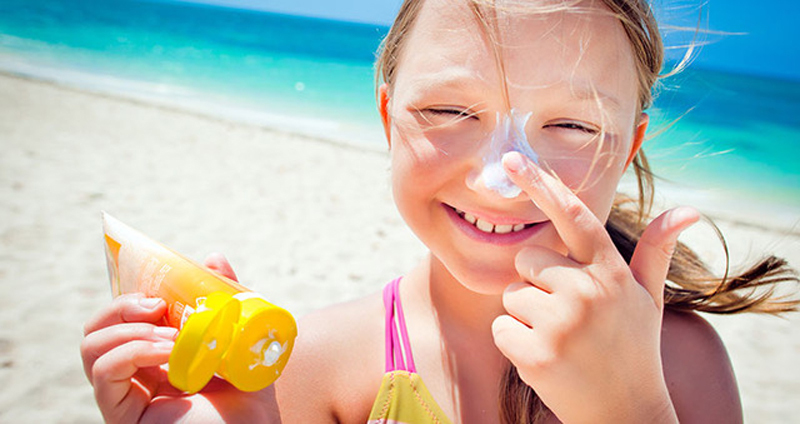 Sunscreens based on inorganic sun filters have grown increasingly popular. They also pose unique challenges in preservation. Like other products with high levels of particulate (i.e. liquid foundation make-up), the presence of particulate increases the susceptibility of the product to mold contamination. Mold prefers to grow on surfaces and the titanium dioxide in these products offer an ample amount of surface area to support growth. In contrast, zinc oxide is used in diaper rash treatments for its antimicrobial properties. The inclusion of this material as a sun filter should boost the preservation of the formula. 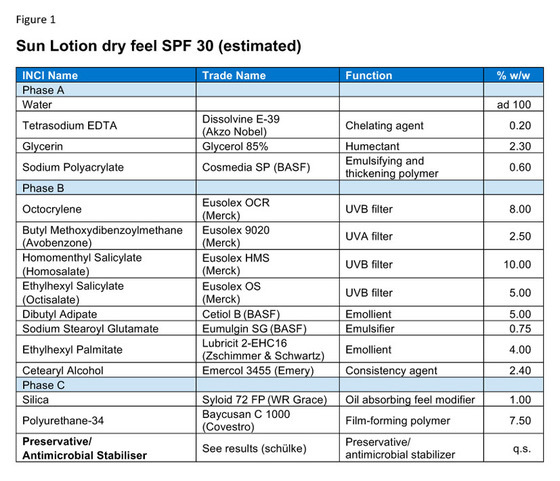 In testing a High SPF Inorganic Sunscreen (figure 3), schülke focused on two non-traditional preservation methods. euxyl® PE 9010 was tested versus sensiva® PA 40 in a 6-inoculation, six-week preservative efficacy test (figure 4). While both systems were able to effectively preserve the sunscreen with the addition of a chelating agent, sensiva® PA 40 was effective at lower concentration. Used without a booster at a use level of 1.0%, euxyl® PE 9010 could not adequately preserve the sunscreen. sensiva® PA 40 is not limited by the same regulatory restrictions as products containing phenoxyethanol. It can be used at 1.5% to effectively preserve this system without the need for any additional boosting. Modern, high-SPF sunscreens are difficult to preserve. The accompanying trend toward softer, non-traditional preservation methods can add to the complexity of formulating these systems. The preservation experts at schülke understand the ever-changing needs of the personal care industry.